A True SuperSports Icon. UK Delivery Available. 2013 HONDA CBR1000 Fireblade *Low Mileage, FSH, 3mth Warranty, 12mth Mot* A True SuperSports Icon. UK Delivery Available. 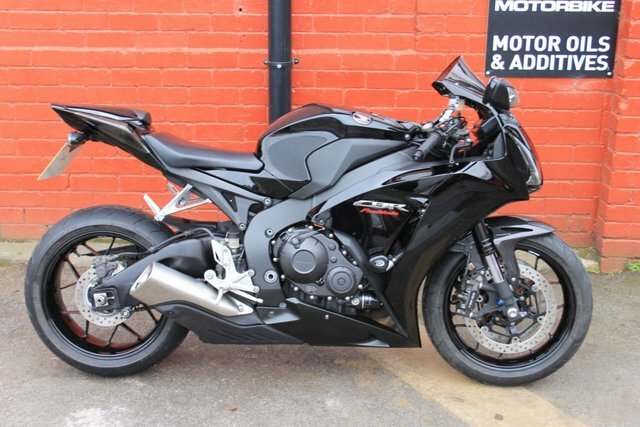 Here we have a 20th Anniversary Honda CBR1000RR Fireblade in Jet Black with just 4K on the clock. FSH, all her keys and booklets are present and a fresh full service was done at Honda at 4023 miles on the 1/219. Finance deals tailored to your budget with low deposit. Credit and Debit Cards accepted. UK delivery available. She will leave us with a full PDI, 12mth MOT and 3mth warranty. The bike benefits from Carbon front hugger, R&G Rad cover, R&G pillion seat trim, Tank protector, Datatool Alarm, ASV Levers, R&G Crash Bungs and a Datatag system. She looks stunning in black. Not much needs to be said about the Fireblade, They are a true super sports icon. Super Fast, Super Reliable and Super Cool. Grab this low mileage machine quick before someone else does. Ride is a friendly down to earth business with a passion for biking. Nationwide Delivery, HPI Clear, PX Welcome, Friendly Customer Service. 01535 658811 ***Check out our customer reviews on the website, at Ride Motorbikes Ltd Facebook page/Autotrader shop and google*** For more information about us, the bike and our stock please visit our website. The adventure starts here! Open 7 Days A Week. Ask us about Locks and Chains, Datatags, Helmets and Heated Grips. Stay warm and secure with Ride.